Costa del Sol is not by chance known as Costa del Golf. More than 70 golf courses, lots of schools, the best climate in Europe and exceptional land, sea and air connections make Málaga province a paradise for this sport lovers. Do we play a few holes at the Mediterranean beachfront? Costa del Sol has a very deep-rooted golf tradition. In 1925 the Real Club de Campo, Parador de Golf de Málaga at present was founded and since then on, love for this sport has done nothing but grow. But it would not be just until the sixties when actually the golf courses’ bloom started. 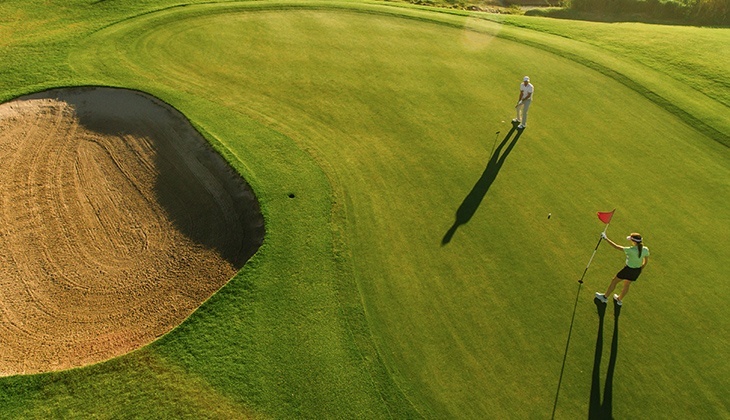 Nowadays, the area has the largest concentration of golf courses in Spain and even in Europe. Many of the courses built in the Golf Coast are works of renowned architects as Robert Trent Jones, who designed the yard of Real Club Valderrama, one of the most representative golf courses in Spain. This course was the first hosting the famed tournament Ryder Cup outside the UK. World stars within this sport have done their bit to the drawing and development for lots of golf courses in the province. Tom Simpson, Michael Campbell, Peter Gustafsson, Cabell Robinson and Miguel Ángel Jiménez are some of the names that have contributed with their drawings to create great golf courses in Costa del Sol. But nobody can live by golf alone! When the golf day ends, you will find plenty of cultural and leisure chances. You can take the opportunity to visit any of its 103 towns and villages, discover its museums, walk the streets at Málaga center and soak up its culture. Gastronomy is another of its main attractions, with a perfect synthesis between tradition and avant-garde, with eight restaurants in the province awarded with a total of nine Estrellas Michelin.